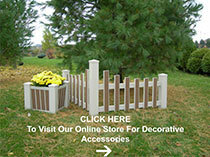 When building your outdoor space, consider Homeland railings and columns to add that special, decorative touch. You’ll find that their products not only offer great style, but outstanding quality and design flexibility as well. Vinyl systems from Homeland offer exceptional durability to last for decades. With 16-gauge galvanized steel or aluminum reinforcements, their railings are built to stand-up to insects and harsh weather conditions – from summer’s intense heat to winter’s severe cold – without cracking or breaking. In addition, there are no exposed fasteners … so rusting and weakening of railing joints won’t be a problem. In contrast to the frequent maintenance required by wooden decks and railings, Homeland vinyl systems give homeowners true simplicity and unending beauty. Cleaning the railings is a breeze; just spray with a hose to whisk away leaves and dirt. Homeland vinyl railings have a Limited Lifetime Transferable Warranty and even include UV protection, so they’re resistant to color fading. Homeland railings are made to fit your lifestyle, and to coordinate with your architecture. We offer a wide variety of railing styles and colors to ensure a good match with the look of your home. Plus, you can customize your outdoor living space even more by wiring speakers and lighting through the rails!